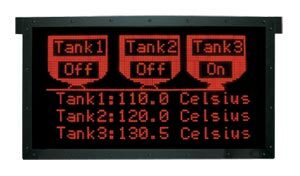 The BFD is a large 977.9 x 482.6 mm (38.5 x 19") LED display (128 x 64 pixel resolution) which is driven from the RS485 port of a G3. The BFD is built using 32 display boards in an 8 column by 4 row configuration. When used with a G303, the BFD will display the contents of the current G3 page. When used with larger G3s, the desired information is selected by using a "display primitive" on the current G3 page. Multiple BFDs can be driven from a single G3 (see Using Multiple BFDs with a single G3). The exact number is dependent upon the lengths of the individual wiring runs. The display is housed in a welded steel enclosure and the display window (0.118" thick red acrylic) is sealed to the enclosure using a gasket and bezel strips. The gasketed rear panel is bolted to the enclosure. The ventilation slots and internal fan are designed to provide adequate cooling in a normal industrial environment. The enclosure is designed to hang from an overhead support. The BFD enclosure can be easily converted for indoor NEMA 4 operation using the optional BFD NEMA 4 conversion kit. The kit includes a sealed cover plate (to plug the vent hole), an external "cabinet cooler" (to replace the internal fan) and a DIN-rail mounted power supply to operate the "cabinet cooler". Power to the BFD is provided by a universal AC input power supply. The AC power and the G3 RS485 cable enter the enclosure through separate conduit fittings. AC power connects to the power supply via a removable 3 position terminal block. The RS485 signal connects to the communication board via either an RJ45 modular plug or a removable 2 position terminal block. Note: Comes with mounting kit and operator’s manual.